World Cup Series Final Marsella, día 1. 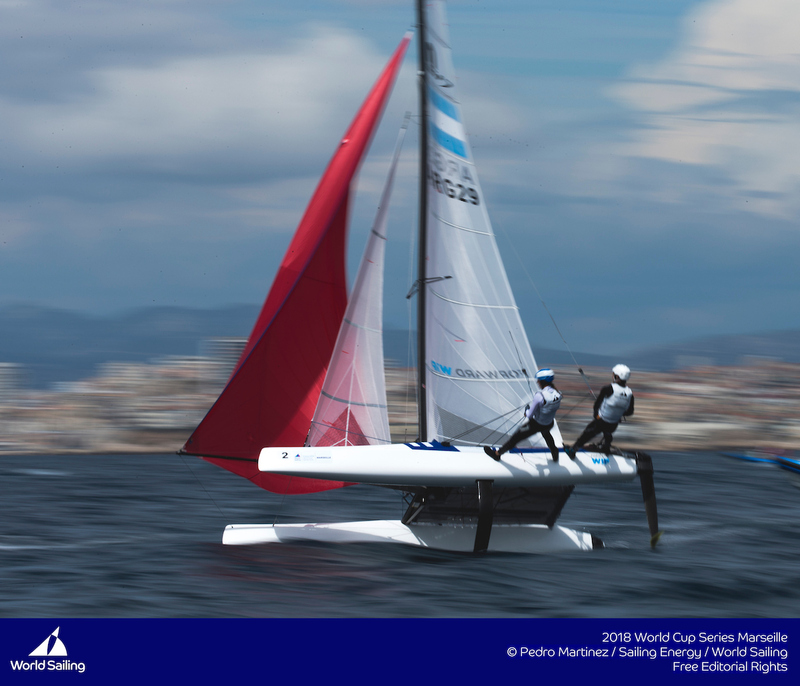 After several days of preparation, tuning and training, racing at Sailing’s World Cup Series Final in Marseille, France got underway on Tuesday under clear blue skies. Anticipation has been building in Marseille as the venue will host the Paris 2024 Olympic Sailing Competition. For the locals, it’s the first opportunity to see the Olympic fleets up close and personal. It was a perfect start to racing for the British Men’s RS:X team as they dominated the opening race. Tom Squires snapped up the race win and was duly followed by Kieran Martin and Andy Brown as they grabbed the early initiative. But their dominance didn’t last long as the Gamagori World Cup winner, Pawel Tarnowski (POL), took control at the front of the fleet, winning the next two races after an 11th in the opening race. “It was a good day overall,” commented Tarnowski. “The last time I sailed in Marseille was last year and, due to a wedding in Poland, I only arrived yesterday so didn’t have enough time to train. “I wasn’t used to the conditions here and during the first race I decided to go all the way to the right, with the French, but that wasn’t a good idea. In the Women’s RS:X, Lilian de Geus (NED) put a scoring penalty from race one behind her to pick up a second and first which sees her tied at the top with Gamagori World Cup gold medallist, Hei Man Chan (HKG). Croatia’s Nenad Bugarin sprung a surprise in the Finn fleet, grabbing an early lead. “I had two solid races,” explained Bugarin. 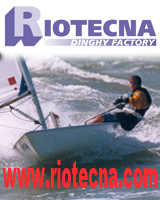 “I had a good start on my first race with high speed on my upwind and downwind. I finished fourth in my first race and then first in the second. Hannah Mills and Eilidh McIntyre (GBR) got their World Cup Series title defence off to a strong start in the 20-boat Women’s 470 fleet. A fifth and a race win positions them nicely at the head of the leaderboard. Brazil’s Fernanda Oliveira and Ana Luiza Barbachan picked up the opening race win but were unable to come close in the second as they finished down in 11th, ending the day fifth overall. The two race wins in the Men’s 470, went the way of Jordi Xammar and Nicolas Rodriguez (ESP) and Hungary’s Balázs Gyapjas and Zsombor Gyapjas. The Spanish team backed it up with a fifth to grab the lead, but the Hungarians could only manage a 14th which puts them seventh. Plenty more racing is on the horizon in the Men’s 470 but the teams in between the Spanish and Hungarian teams will be content as very little separates them so far. 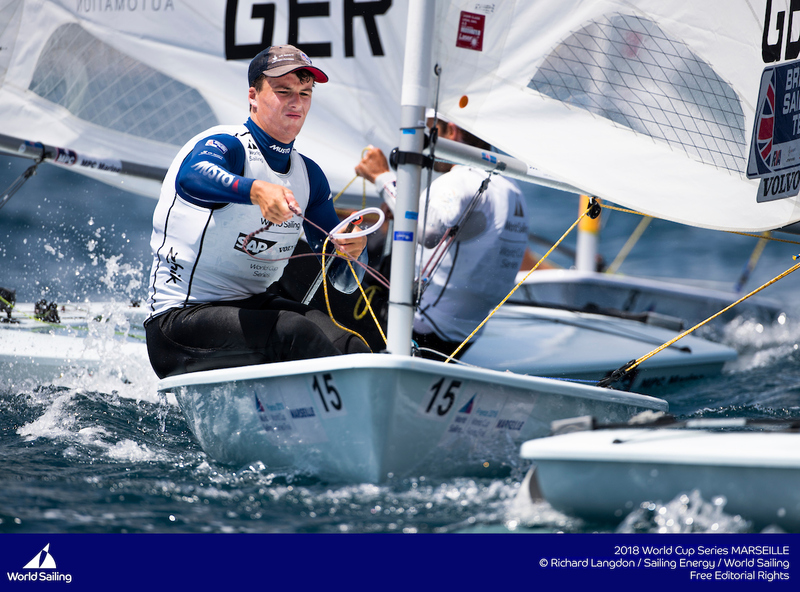 Lorenzo Chiavarini (GBR) thrived in the Laser, snapping up a second and a first in the 25-boat fleet. “It was fantastic, just what I like – nice and shifty conditions with plenty of sunshine. We had around 10 knots which was great for hiking,” commented the British leader. 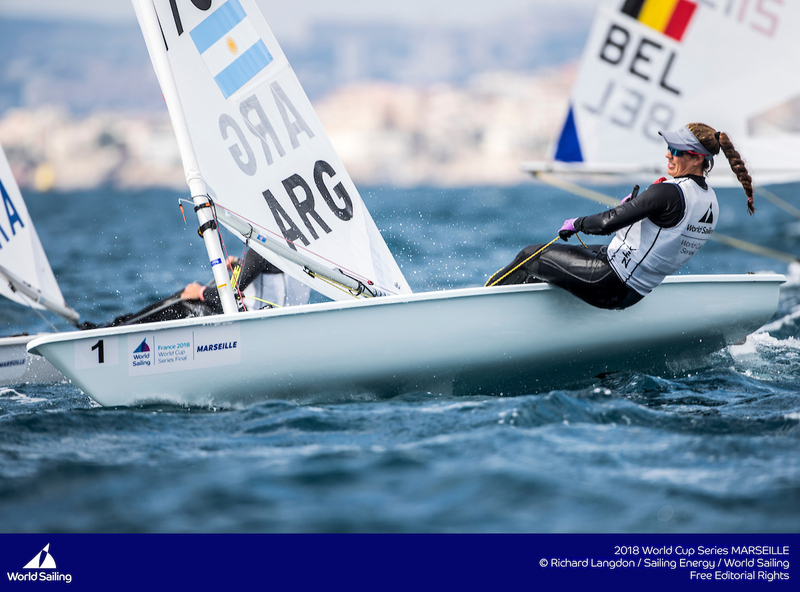 Belgium’s Emma Plasschaert and Finland’s Tuula Tenkanen are locked on six points apiece at the top of the Laser Radial leaderboard after two races. Maud Jayet (SUI) won the opening race and is 12th overall, and race two winner, Alison Young (GBR), is in seventh. Medal Races on Saturday 9 and Sunday 10 June will be streamed live on World Sailing’s YouTube Channel and will bring the event to a close.